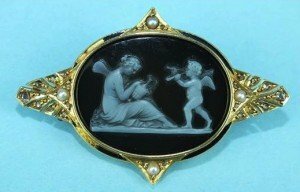 A Victorian brooch set an oval hard stone cameo depicting a classical scene of winged goddess and cupid, within an unmarked black-enamel-lined yellow gold mount set rose-cut diamonds and demi-pearls, with locket back. 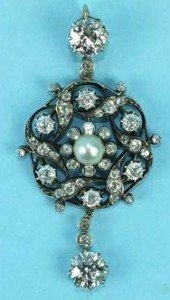 A Victorian pearl and diamond pendant centrally-set a pearl and eight collet-set old brilliant-cut diamonds, within an open-work wreath of diamonds with gold and silver mounts, with a claw-set brilliant-cut diamond drop. 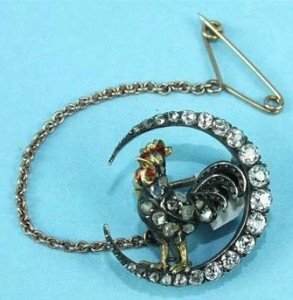 A Victorian diamond brooch in the form of a cockerel within a crescent moon, the silver cockerel set with rose-cut diamonds, with red-enamelled yellow gold head and gold legs, the crescent set graduated old-cut diamonds, in silver and gold mount. 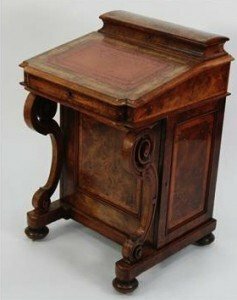 A Victorian Burr walnut wood and line inlaid Davenport desk, the domed top stationary box above a sloping front with gilt tooled salmon coloured leather insert, enclosing a Sycamore lined interior with pair of short drawers and conforming pair of faux drawers over a panelled front with scroll supports and a panelled side cupboard door, enclosing four drawers and raised on a shaped plinth base with turned feet and white pot castors. 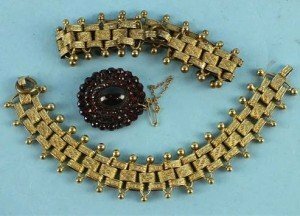 A Bohemian garnet cluster brooch set a garnet cabochon within three tiers of faceted garnets, and two yellow metal bracelets of textured links and beaded edges. 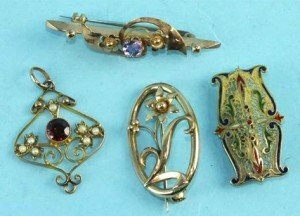 A 9 carat gold oval brooch with flower motif, a small Edwardian 9 carat gold garnet and seed pearl pendant, a small enamelled brooch and an amethyst-set brooch. A three-stone diamond cross-over ring, the old brilliant-cut diamonds claw set in 18 carat yellow gold mount. 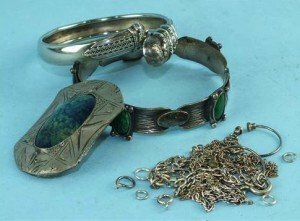 A Ruskin-style enamel and white metal brooch, a plated metal bracelet with green enamel plaques, a white metal snake bracelet and a small quantity of chains etc. 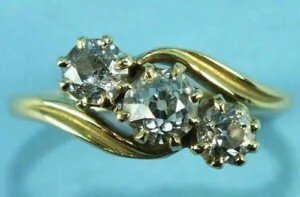 A Victorian five-stone diamond ring, the graduated old-cut diamonds claw set with diamond points between, in 18 carat gold scrolling mount. A diamond-set ring, the crown set with rose-cut diamonds, central setting vacant, in unmarked yellow gold mount. 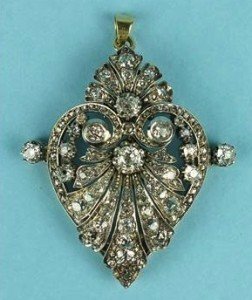 A diamond-set luckenbooth ring, the heart and crown set with rose-cut diamonds, central setting vacant, in unmarked yellow gold mount. 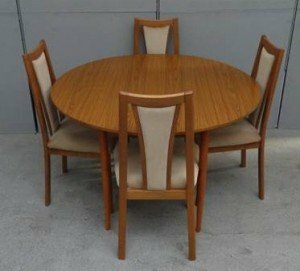 Drop Flap Wood Effect Dining Table & Set 4 Matching High Backed Chairs on square tapering front supports. 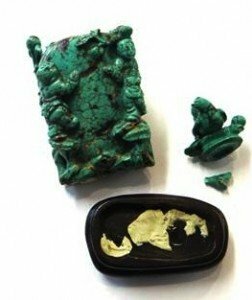 A Chinese turquoise vase and cover and cover, the exterior decorated in high relief with four boys amongst fruiting branches, the cover with bird finial. 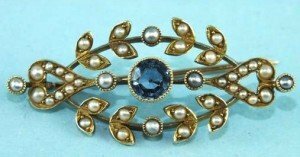 An Edwardian brooch of elliptical marquise shape set seed pearls around a collet-set sapphire, in 15 carat gold mount. An emerald and diamond ring set three graduated emeralds and two old brilliant-cut diamonds, with diamond points between, in unmarked yellow gold mount. 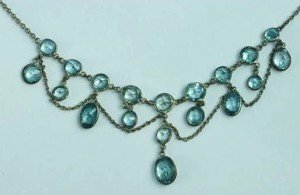 A blue zircon fringe necklace set oval and round-cut zircons in white metal frames with trace chain festoons between, on ribbed chain. 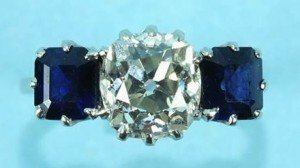 A sapphire and diamond three-stone ring claw-set an old brilliant-cut diamond between two emerald-cut sapphires, in white metal mount. 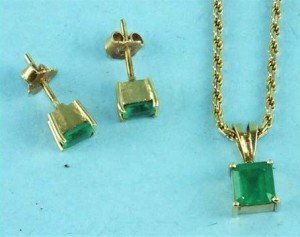 An emerald pendant, four-claw set a rectangular emerald, suspended on 14k gold chain and a pair of matching ear studs. 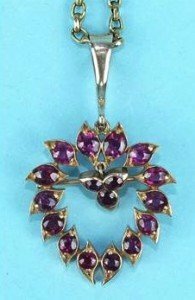 A ruby brooch/pendant of heart shape set fourteen round-cut rubies around a small drop set three rubies, in unmarked rose gold setting, on 9ct belcher-link chain. 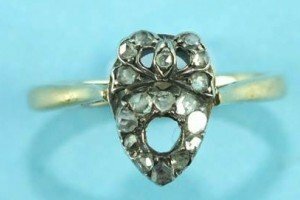 A Victorian sapphire and diamond ring claw set three round-cut sapphires and two old brilliant-cut diamonds, with diamond points between.